Acappella has long been a defining force in contemporary Christian music. After 16 albums, over 2,400 concerts and numerous radio hits, Christian music's premiere vocal group delivers Hymns For All The Ages a fresh twist on 12 classics. Following in the footsteps of the landmark Hymns For All the World album released in 1995, Hymns For All The Ages serves up favorite and familiar songs in exciting ways that will move you to praise the Lord. In its 20-year history, Acappella has become a model of excellence in music and commitment to ministry. In that time, the foursome has performed to millions of people in the United States, as well as South Africa, Australia, Brazil, China, Jamaica, France, Holland, Switzerland, the Bahamas, the Cayman Islands and the French West Indies. For the four members of Acappella, Nicolas Dunbar (baritone), Gary Evans (bass), Matt Nunnally (first tenor) and Sean Samuel (lead), life on the road keeps them busy. Joining them on stage will be backup singers Cory Martin and Dale Pratt. In 2002, the group will perform in an unprecedented 140-plus concerts. A change in Acappella's scheduling now allows the group members and their families to spend the early part of the week at home and the weekends singing in cities around the nation. In the fall of 2001, Acappella once again found that the Lord can use his children during moments of terrible stress and pain. 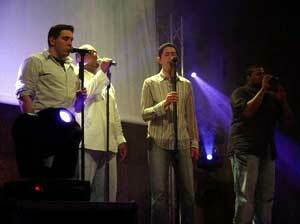 God used Acappella to heal others after the tragic events of September 11. The group's scheduled tour took them through the northeastern United States the area hardest hit by the terrorists. A concert planned for Uniondale, NY a devastated community only 30 miles away from the World Trade Center quickly became a benefit concert for the victims of the attack. Acappella was also at Dover Air Force Base when the first American casualty in the Afghanistan conflict landed on U.S. soil. The Lord put Acappella in the right place to extend His love and healing power. This year has been a year of celebration for Acappella. They tied with labelmates, The Firemen, for a Contemporary A cappella Recording Award (CARA) for Best Religious Album for Hymns For All The Ages, giving Acappella its fourth award since the Contemporary A cappella Society of America began awarding CARAs in 1992. Acappella also secured the runner-up position in the Best Religious Song category for "In The Cross" off of Hymns For All The Ages. In late March, concertgoers at the Tulsa International Soul-Winning Workshop in Tulsa, Okla., were treated to the Acappella Reunion Concert featuring 20 years of Acappella vocalists with each era performing the songs that defined their Acappella. They brought the house down giving the audience memories to last a lifetime and leaving them hungry for more. Acappella has many exciting things planned for Summer/Fall 2002. Concerts are scheduled for Mississippi, Michigan, Pennsylvania, California, Oklahoma, Kansas, Texas, Colorado, Missouri, Louisiana, New York, New Mexico, Arkansas and South Dakota. And last, but certainly not least, Acappella is planning the details for their first trip to Japan. There's still room in the schedule so contact us to reserve your preferred date. Acappella's origins can be traced to Keith Lancaster's tenure at Williamstown Bible College in West Virginia where he sang in a school-sponsored a cappella quartet that toured the country recruiting students for the school. With a natural gift for music, Lancaster quickly became a focal point for the group, and was encouraged to employ his skills as a songwriter and vocal arranger. Though he did not realize it at the time, the foundation for Acappella was being laid. Lancaster produced two independent albums for the group before graduating and assuming a job in church ministry, functioning more as teacher and evangelist than musician. But music had woven itself into the very fabric of Lancaster's being, and the tug on him was insistent and unyielding. Lancaster founded Acappella Ministries in 1982 in his hometown of Paris, Tenn., forming a quartet that two years later was formally christened Acappella. Acappella has seen several changes in personnel over its life, most notably in 1988, when Lancaster retired from his onstage role with the group, choosing to stay home and run the ministry's business affairs, as well as concentrating on songwriting and production. Fans were relieved to hear that Acappella's trademark sound remained virtually unchanged, while its purpose simply gained strength as the years progressed. Dunbar, originally from Augusta, Ga., came to Acappella in May of 2002. Having already graduated from Southwestern Christian College in Terrell, Texas, (a school which produced other Acappella singers including George Pendergrass and Wayburn Dean) we found Dunbar at Abilene Christian University in Abilene, Texas. Evans, the wonder bass and group veteran, began his tenure in January of 2001. However, his history with the group stretches back a bit further. At age 7, Evans knew he was going to be a member of Acappella someday. His father still proudly displays the wood burning project his son did showing himself and three buddies singing in Acappella. After that, it was just a matter of waiting for reality to catch up. Evans is joined on the road by his wife, Melody. Nunnally hails from Searcy, Ark., and brought his high tenor prowess to the group in the spring of 2002. Nunnally, who is a Searcy, Ark., native, attended Harding University and was a founding member of the six-man a cappella group Glorify Him. He is joined in the ministry by his wife, Carolyn. Samuel comes to Acappella from Jacksonville, Fla., and Faulkner University in Montgomery, Ala. He brought his smooth, soulful sounds to the ministry in May of 2002. Almost as distinctive as Acappella's original sound is the group's devotion to fans, and its determination to nurture and maintain ongoing, face-to-face relationships with the people who still flock to see and hear them. In fact, many nights the members of Acappella spend more time after the concert talking and praying with fans than they do on stage. Acappella is active in prison ministry, constantly endeavoring to carry the Gospel message far and wide. 'Our main goals are to plant the seeds of the Gospel in hearts that haven't heard yet, and to encourage and strengthen the Body of Christ in their faith,' said Lancaster. Their music has certainly reached the lost and encouraged fellow Christians for the past 20 years. Acappella has shown us that some things, such as praising God, just get better with time. Even as Hymns For All The Ages celebrates Christians' musical heritage, it demonstrates and reaffirms Acappella's commitment to spreading God's message. Well-equipped with talent, tenacity and the touch of a mighty hand, Acappella continues on its journey, fueled by faith in God, compassion for all His creation, and, at the end of the day, abiding love for that sweet, sweet harmony.